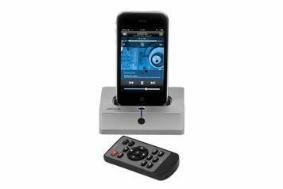 MANCHESTER SHOW: Arcam to launch new iPod irDock with remote control | What Hi-Fi? It will make its debut at the Manchester Sound & Vision Show this weekend, and goes on sale in November for £150. The irDock can be used with any hi-fi or home cinema system, and will also integrate with all Arcam Solo systems, the company's latest AV receivers and the Arcam T32 DAB tuner to enable control of the iPod/iPhone using Arcam's own system remotes. What's more, when used with an Arcam Solo, Arcam AVR500/AVR600 receiver, the AV888 preamp/processor and T32 tuner, the irDock will show the music being played from the iPod on the Arcam's display. On non-Arcam systems, the supplied infra-red remote control works with all iPods and iPhones (including the latest 3G S models). Video stored on your iPod/iPhone can be viewed on a TV using the S-Video or composite connections, thanks to the incorporation of Apple's video authentication chip. The irDock is made from cast aluminium, has an intelligent charging system with an on/off button and includes a built-in audio preamp with high-performance op-amps. When charging, most docks leave the iPod/iPhone charging all the time, which can damage the battery. Not the irDock, which allows you to switch off the charging function and play the iPod/iPhone using its own internal battery. This is said to improve battery life and sound quality. A damped rubber base, enhanced RF suppression and a low-noise power supply further improve performance, says Arcam.